Cyrill Demian accordion, circa 1830, bought on eBay for £5.50! To my utter astonisment and delight, I bought another accordion (my fifth) by the inventor Cyrill Demian, circa 1830 and in its original Biedermeier case, on eBay yesterday (described as "Vintage accordion, perfect for parts") - for all of £5.50! Re: Cyrill Demian accordion, circa 1830, bought on eBay for £5.50! Congratulations triskel! Sometimes it seems these instruments fly like an arrow directly to their rightful home! If you look at the numbering of the keys you'll see it's left-handed, which three of the four I already had are. This is normal on the earliest of them and was by analogy with stringed instruments - on which it's the right hand that produces the sound (by plucking or bowing), and the left hand that fingers the notes. 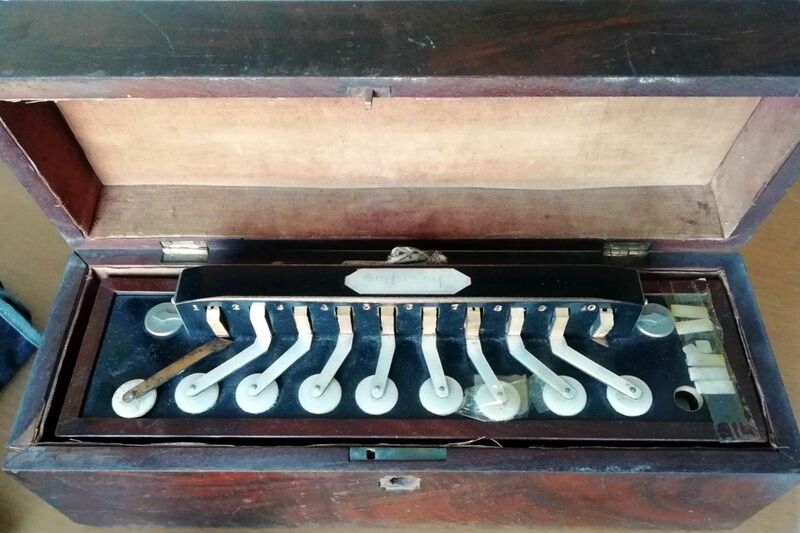 So it arrived in due course, forwarded to me via England, and I'm very glad to add this one to my collection of (very) early free-reed instruments. Though I was somewhat upset to receive it in an oversized, lightly padded, plastic mailing bag that was totally inadequate for mailing something heavy and fragile, and almost 200 years old (it needed wrapping in layers of bubblewrap, then covering in cardboard, at the very least) - so that there were numerous slivers of broken off veneer floating about, and even some of the spruce carcase of the case (from where a hinge had broken loose), in the bottom of the bag. And I was right about there being a Keith, Prowse stamp (and also remains of their label) on the instrument. I'll take some photos of my own of it now, and add them to this thread.